The Tiny Skillet: Another Tailgating Time! ...or is it now called Watergate? Ha! Just kidding. Today after the car show down at Sarasota Square Mall, we will be out on the boat enjoying the nice weather and I will be checking in here later. Time for the Pro Bowl and Tailgating Time week # 21 - The good food continues, so keep those dips and party treats coming, and a pitcher full of cold ones! Everyone is getting ready with some great ideas for The Super Bowl! Bring over your famous recipes for you favorite foods and party things! I am saving my chili recipe for the Super Bowl! ♥peachkins♥ - yes, it all looks so good! Anncoo - thanks for joining in, I love your Koi Fish, can't wait to try them! WOW! Wish I was there intead of this deep freeze we can't seem to get rid of. Ahhh...finally! I was here last night but failed to make any comment. The site was very slow. Pheww... lots of stuff need to be prepared today. so, have to hop over before starting my day. Hope you're having a great day too. We were able to get out boat out on Saturday...such a great day...that same area is scheduled to get a foot or more of snow tonight and tomorrow! Mother Nature has a mean streak. Hope you enjoy your Super Bowl Sunday. You are so lucky to have nice weather! Hope you enjoyed your day out on the boat. 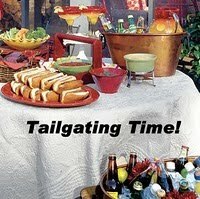 Thanks for hosting Tailgating Time! Yummy food on display...wish I can try them all but serious my to do list is getting too long to handle lol! Tailgating on a boat. I like it! I was wondering where you lived to be able to put a boat in the water this time of year. Now I know. We owned a sailboat in the 90's and spent time on both coasts of Florida. Loved it. I guess I better start thinking about our Super Bowl snacks. Great spread of food :-) I am jealous that you guys have wonderful weather there.. Here ,for the past 2 days the day temp is below zero..yikes ! Your boat looks so fun. Enjoy!